First of all, let's emphasize something: yes, this is the fastest bike in its class, but it's primarily intended for efficient traveling to work and comfortable touring, either with or without full luggage. Holder of the one hour world record, ridden with standard parts, ready for use in everyday traffic. Or: how a "Racer" is also an all-round means of transportation. The M5 Carbon High Racer in keywords: lightweight, rigid, smooth running, aerodynamic, practical, comfortable. 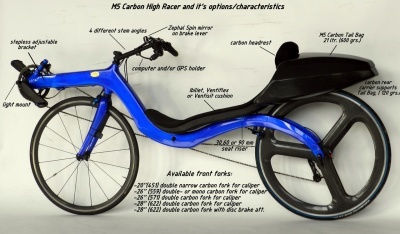 A long period of development en testing preceded the production of the Carbon High Racer. Decades of knowledge, experience and the currently available technology can be found in this full monocoque bike. The countless races which are ridden by enthusiastic riders, M5 founder Bram Moens being one of them, led to an unmatched design in terms of speed and ergonomics. Make an appointment and visit us in Middelburg for an extensive introduction to the M5 Carbon High Racer. The elegant simplicity of the carbon frame has a highly thought through geometry. First of all, this frame enables the use of 622 mm (28 inch) racing wheels. Not only a large range of tyres become available with this size, but the large wheel diameter also ensures a low friction ride and improved comfort. 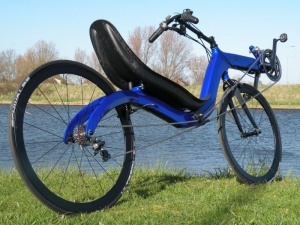 Although large wheel diameters are applied, the seat height is only 48 cm, up to 20 cm lower than other recumbents with large wheels. A low, aerodynamical position for the rider, while maintaining full overview of the surroundings. The 28 inch wheels and the wheelbase of 138 cm warrants controlled handling, while the frame can be kept compact. The geometry also leads to a perfect 50/50 weight distribution on the wheels. Like all M5 models this design also has low friction propulsion and high quality components. Another result of the geometry of the M5 Carbon High Racer is the possibility to use short handlebar stems. No 40 to 50 cm long stems, but compact ones of only 17 to 23 cm in length. This implies quite a lot: hinged handle bar are completely redundant, less flex, less weight, mounting the bike becomes much easier, arms in aerodynamical position (elbow in flank) and better handling. 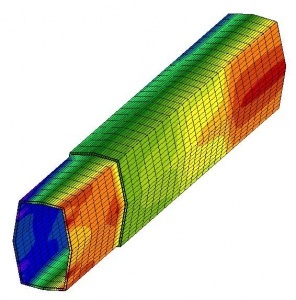 The M5 Carbon High Racer has been subject to a comprehensive Finite Element Method-analysis (FEM). With FEM the expected strains on the product are examined with computer simulations. This not only enables us to determine the optimal orientation of the carbon fabric in the frame, but also which wall thickness should be applied at any position on the frame. Result is the strongest possible frame, with the lowest possible weight. During this High Racer optimization Bram Moens collaborated with Wout Ruijter, graduated at the Technical University of Twente (Netherlands) and promoted at the University of Nottingham (GB). Currently he is working at Vestas Windenergy in Denemark. The complete M5 Carbon High Racer weighs 9.1 kg. It's always fun to let an unsuspecting visitor lift the CHR off the floor. They expect some effort and are amazed when the opposite is true. So little weight! Handle bar: ultra light Alu 7075-T6, 45 grammes. Minimal inner leg length when using a 26 inch front wheel: already at +/- 80 cm!! / 31,5 inch!! 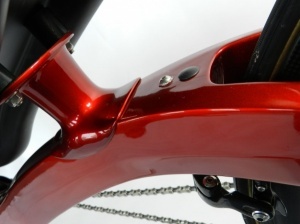 The black anodized right dropout for the rear wheel is made from Alu 7075-T6 too. It's interchangeable and available in two different lengths, to utilize a cassette for flat terrain or for mountainous circumstances. Super safe male/female alu joints for bracket housing and chain guider.